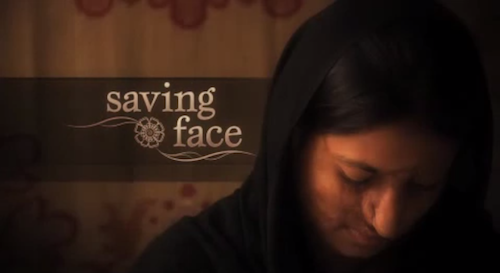 Image from SavingFaceFilm (via YouTube), a film about Pakistani acid attack survivors. On March 17, 2012, Fakhra Yunus, a thirty-three year old Pakistani woman, committed suicide by jumping out of a six-story building in Italy. Twelve years ago Fakhra’s ex-husband Bilal Khar, the son of an influential Pakistani politician, threw acid on her face when she left their marriage after enduring years of his physical and emotional abuse. What followed were 38 operations, courtesy of the Italian government, to save her face and her life. But acid has a way of continuing to eat at a person, months and years after it’s touched your skin. Eventually it ate away at Fakhra’s soul. Because this is not an isolated case in 2011 the Pakistani Parliament passed the Acid Attack Bill, which increases punishment for acid attacks to a huge fine and life imprisonment. One year later Sharmeen Obaid Chinoy’s created awareness with Saving Face, a film about Pakistani acid attack survivors that won the Oscar for best short documentary. But despite the law and the documentary Pakistanis are now realizing that the war against acid attacks is nowhere near being won. Yet Fakhra’s death has galvanized Pakistani citizens, who are calling for the arrest and retrial of Bilal Khar, who used his father’s political connections to escape being jailed for this crime in 2003. Bolo Bhi (Speak Up), a Pakistan NGO dedicated to issues of advocacy, policy, and research, circulated a public appeal to the Supreme Court, the National Assembly, and the Senate demanding that Khar be brought to justice. In a television talk show that aired the day of Fakhra’s funeral, women from several political parties spoke about the Acid Attack Bill. They explained that, while passed, the bill’s implementation is woefully inadequate in Pakistan. They also spoke of a particular Pakistani mindset that encourages men to think of women as their property, to be used and disposed of at will. Implementation of the law won’t change that mindset without education and awareness, but for the first time ever the issue is being spoken about openly, written about in the media, and discussed on Twitter and social networking sites. Even though there is uncertainty about whether the case against Bilal Khar can be reopened after so many years and the open debate won’t give Fakhra her life back, it might just start a revolution that promises us there will be no more Fakhras in the future.